The author of this article, Lindsay Foyle, is a journalist and cartoonist who worked on The Bulletin and The Australian. He also lived in Glebe for 25 years and has over 5000 photos of the suburb and spends much of his time writing about Australian cartooning. He was one of the founding members of the Glebe Society. There have been two Harold Parks in Sydney and now there are none. The better known of the two was the racetrack sitting on the edge of Forest Lodge. The racecourse had a peculiar history, and was known by four different names. Founded in 1890 as an athletic ground, on what had been heavenly timbered land, reclaimed mangrove swamps (which were bordered by Johnston’s and Orphan School Creeks), with part of the original orchard on Sir George Wigram Allen’s Toxteth Estate it was first known as Lilybridge racecourse and then as Forest Lodge racecourse. It had a name change following some alterations and improvements in 1904 and became the Epping Racecourse after Joynton Smith (1858-1943) leased the property. It was possibly named after the Epping Racecourse, which operated in England between 1838 and 1858. Smith became Lord Mayor of Sydney in 1918 and is best remembered for launching Smith’s Weekly in 1919. He sold his interests in the Epping Racecourse after building the Victoria Park Racecourse. At the time Victoria Park was said to be the finest pony horseracing course in Sydney. In 1908 a clay-and-cinders track of 1.81 kilometres in length was built around the horseracing course and was utilised for speedway racing by both cars and motorcycles until the early 1920s. 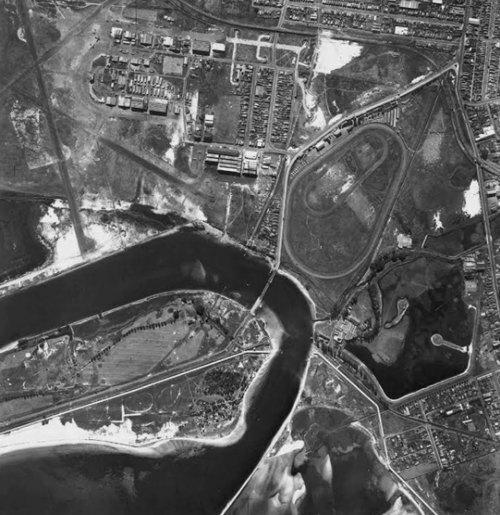 The last meeting at the Victoria Park track was on February 14, 1942. The three-storey totalisator building is now the Green Square library. Tote Park, Joynton Park, Grandstand Parade, Victoria Park Parade and Joynton Ave in the area are also reminders of the racetrack. The NSW Trotting Club acquired Epping Racecourse in 1911. In 1921 they spent £16,122 acquiring Byrne’s Bush, 50 acres in Botany with the intention of building racetrack on it. It had been owned by some members of the NSW Trotting Club who went by the name of the Harold Park Syndicate. The reason behind the move was that many members of the club thought there was a likelihood of the Epping track being resumed for the Tramway Department – a possibility that never eventuated. The land they bought was only a short distance from the Ascot racecourse, which was on the Botany Rd tram route and is now part of Kingsford Smith Airport. The only surviving physical evidence of Ascot is 15 fig trees, which formerly lined the racecourse entrance located near the airport’s long-term car park. The trees are subject to a heritage preservation order. 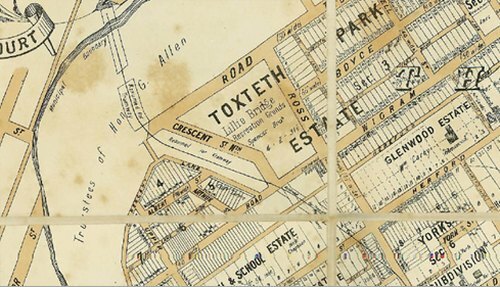 The Trotting club land was also on Botany Rd and had a frontage onto Botany Bay near Bay St. It was not covered by bush, but was level and cleared. At one time the land had belonged to Andrew Byrne (1775-1863) who was born in County Wicklow, Ireland. His family was involved in the 1798 Irish rebellion and consequently Byrne was banished – without trial or court martial – to Sydney. On arrival in 1800 Governor King gave him his freedom and in 1831 he was granted 30 acres at Botany, which became part of Byrne’s Bush. NSW Trotting renamed Byrne’s Bush as Harold Park soon after buying it. In 1925 Hornsby Council pressured the NSW Trotting Club to change the name of Epping racecourse back to Lilybridge, due to the confusion with the suburb of Epping. The trotting club did not like the idea and informed the council the racecourse had been known as Epping for a quarter of a century, and the name was not going to be changed. The following year the club announced they were considering selling the racecourse and moving their operations to Harold Park. While nothing happened with the projected sale in 1929, NSW Trotting Club sold Harold Park to the Kensington Racing Club for £30,000. The money was put to use upgrading the Epping Racecourse. It was only then when NSW Trotting accepted there was confusion between the racecourse being known as Epping and the suburb of the same name. Their solution was to rename racecourse, not to Lilybridge but to Harold Park, after the property the club had owned and recently sold at Botany. Most historians claim the track was named after an imported trotter Childe Harold which had died in 1889 – one of the great progenitors of the stock of the early days of trotting in Sydney. The horse was probably named after Lord Byron’s poem Childe Harold’s Pilgrimage. However the story does not fit with newspaper reports of the time. What is most likely is the syndicate, which had owned Byrne’s Bush had been named after the horse. Then Byrne’s Bush was renamed after the syndicate and Epping Race course after the land at Botany. So it could be said the Epping Racecourse was also named after the horse by extension. In 1929 Botany Council decided to recommend that Byrne’s Bush should be utilised as a residential area. It was eventually sold to a developer who built houses on it. Racing at Harold Park ceased in 2010 and 1200 residential apartments built by Mirvac now cover the track.